Author J. A. Konrath, who has been self-publishing on Kindle and reporting about it for quite some time, just contracted to have the latest in his series of novels featuring female cop Jack Daniels published by the new Amazon Encore imprint. Encore was originally announced as Amazon’s way to pick up and feature already self-published books. They apparently bent the guidelines a bit to include Konrath’s yet-unpublished book, Shaken. Amazon will publish the Kindle edition at $2.99 in October and release a paperback at $14.95 next February. Although Konrath is a media- and tech-savvy author who has published with major New York houses (the Jack Daniels series was previously published by Hyperion), he is not a regular NY Times Bestseller brand. Not only is he not a multi-million dollar advance recipient, he makes it clear that the novel he just signed with Encore was rejected by the New York publishing houses. So Amazon had a low bar to jump to secure him for its Encore line. Nonetheless, this is a significant jolt to conventional publishing economics. Sales of Konrath’s $2.99 ebook will deliver him about $2.10 a copy (Konrath says $2.04; not sure where the other six cents is going…), as much or more as he would make on a $14.95 paperback from a trade publisher, and significantly more than he’d make on a $9.99 ebook distributed under “Agency” terms and current major publisher royalty conventions. And, however one feels about the degree to which pricing is a barrier to ebook sales, one must assume that the $2.99 price will result in a lot more ebook sales than a $9.99 price would. Many times the sales! We’ve been imagining a split market for ebooks: “branded” ones from conventional publishers being sold in the $10-$15 range and “commodity” ones from lesser-known sources (authors and publishers) at $1.99 and $2.99. Over time, we figured that improved curation of the cheaper ones, plus promotional pricing by the branded ones, would drag the overall pricing down. That’s been behind our concern that maintaining anything close to the current pricing for print will be almost impossible to do over time. I think “over time” just became more compressed as a result of Konrath’s move. Here are a few things to think about and watch as we go. 1. Konrath made it clear that his deal with Amazon is under a strict NDA. We’ve gotten used to reading about his financial results and, indeed, Amazon loses a major benefit of their relationship with him if they don’t allow him to talk about how much money he’s making. 2. We got a comment on another blogpost from a reader complaining about not being able to get books on Nook that were available on Kindle. Without any detail as to what books the reader was talking about, it was impossible to diagnose the reason. I could only assure the reader (who wondered if the retailer was declining to stock some titles) that Barnes & Noble certainly wanted everything possible available on Nook. 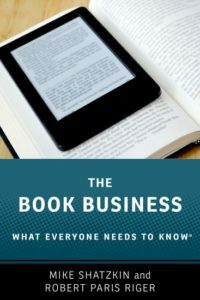 Although Amazon intends to try to sell the print book through non-Amazon channels (an effort Konrath frankly admits he doesn’t place great stock in), it would be a bit of a surprise if they made the ebook available through any non-Kindle channels. 3. Giving up non-Kindle channels today for an ebook isn’t necessarily giving up a lot, particularly with Kindle clients available to be used on other devices. Publishers have been hoping that iBooks and the Agency model would result in a more diverse ebook ecosystem, reducing their dependence on Kindle to reach the ebook audience. What happens if more authors, and bigger authors, follow Konrath’s lead. Could Kindle end up being the only ebook outlet for enough important titles to seriously impede attempts to compete with it? 5. It will be fascinating to see how the rest of the retail trade — bricks-and-mortar — reacts to buying a book which delivers profit to Amazon on each and every copy sold. Sterling was a client of mine when Barnes & Noble bought them. Borders stopped stocking their books almost immediately. Only long-standing relationships with independent retailers saved their distribution through that channel, but there was definitely negative feedback from indies about supporting their perceived enemy. A retailer’s first loyalty is usually — and should be — its audience. By the time Shaken comes out in print, it is likely to have sold tens of thousands of copies as a Kindle ebook and, especially because of its unique role as a groundbreaking publishing model, is going to be known and anticipated by the audience of print book customers who haven’t made the switch to digital reading. Will Amazon sell print to their competitors successfully? Will they offer return privileges? Will they offer competitive discounts? Will they use wholesalers? This will be fun to watch. Konrath’s deal with Amazon was negotiated by his agent (which, according to Publishers Marketplace’s “Who Represents” database is Jane Dystel, but this was last updated in 2006.) We know that Amazon has reached out to agents lately. Many authors will be asking their agents to investigate this alternate avenue to the marketplace on their future books. Signing up new books for what publishers would consider reasonable advances just got harder. So did maintaining a 25% royalty rate for ebooks. I met Joe Konrath once, in January 2007 at Google’s Unbound conference, which I emceed and at which he spoke. So I’ve been aware of his ongoing narrative, making pretty serious bucks selling books of his he controlled (out of print or never published) through Kindle. I have been surprised recently at who did not know about him, including a close friend who herself is a successful mystery writer and all of the agents at a pretty large NYC shop thinking hard about their digital future. His days of relative obscurity are over; Konrath has carved out a permanent place for himself in the annals of publishing history with this move.